Richard Mosdell モズデル・リチャード: Johnny's coming to Japan! ジョニーが日本にやってくる! Johnny's coming to Japan! ジョニーが日本にやってくる! I'm lucky to have some very good friends in my life, so when I talked to the one and only Johnny Tesoro yesterday on the phone, he surprised me by saying he's finally planning to come visit me in Japan next March! With his easy laugh, warm heart, kind manners and mood-maker personality, Johnny makes friends everywhere he goes. 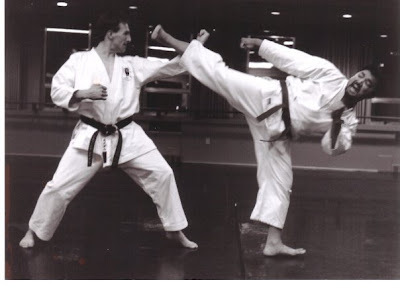 When I use to own the Kenzen Karate Vancouver Dojo in Canada, he was a huge supporter and popular instructor. 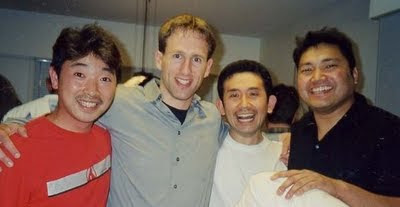 (left to right) Takamasa Arakawa Sensei (Shiramizu), Richard, Shiraishi-san (Nippon Budokan) & Johnny, at the 2001 Canada Wadokai Summer Camp party. I have many wonderful stories about Johnny, who is a professional animator and artist by trade. 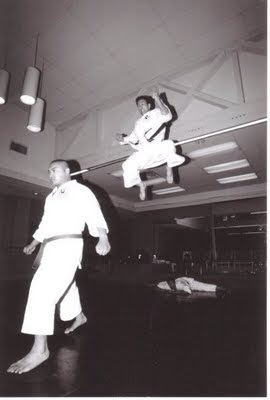 In 2001 we traveled to Japan to watch the World Games Karate competition. Once while Johnny was spectating, he drew an amazing picture portrait of an elementary school child sitting beside him and then gave the child the picture as a gift. Suddenly there was a really long line-up of other kids wanting portraits of their faces too. So Johnny happily sat for hours drawing one after another until everyone who wanted their portrait got one. Of course some adults had lined up too! Johnny's always doing something wonderful like that for people around him. Plus he is the master of the barbeque, which means his visit is the perfect excuse for me to buy a little barbeque grill!